With three weeks left in the Hockey East regular season, BU will head to Burlington, Vermont, for Friday and Saturday games against the Catamounts at Gutterson Field House. Prior to Saturday’s game, the Friends of BU Hockey will hold a pre-game social for alumni, parents, Friends and season ticket-holders. The event at the RiRah Irish Pub at 123 Church Street begins at 5:30 p.m. Complimentary hors d’oeuvres will be served. Game Tickets can be purchased through University of Vermont Athletics. 2021 recruit Danil Zhilkin has scored four points for Team Ontario in its first four games in the 2019 Canada Games. Zhilkin, who plays in the GTHL for the Toronto Marlboros, committed to BU after last summer’s Jr. Chowder Pot. Former Terrier Charlie Coyle was traded to the Bruins by Minnesota in return for Ryan Donato and a fifth round draft pick. Coyle, who has been with the Wild since 2012-13, has 28 points in 58 games. His best season was 2016-17 with 56 points. Coyle joins Charlie McAvoy and Matt Grzelcyk on the Boston roster. Great pick up by Don Sweeney!! Charlie Coyle has so much upside and I think he will find his offensive upside in @NHLBruins black & gold jersey!! AJ Greer scored his first NHL goal in the Avalanche's 7-1 win against Winnipeg. Matt Nieto contributed his 17th and 18th assists for Colorado. McAvoy’s overtime goal gave the Bruins a 6-5 win in San Jose on Monday. It was McAvoy’s fourth goal of the season. ● NHL.com recap and video highlights Your browser does not support iframes. 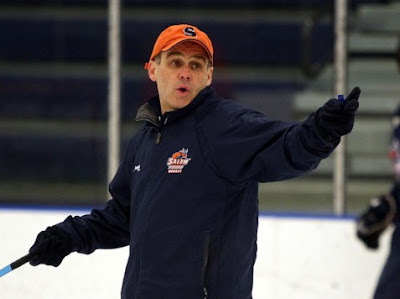 Congratulations to former BU blueliner Bill O’Neill, longtime head coach at Salem State, who hit a milestone with his 600th career win Tuesday when the Vikings defeated Framingham State, 5-4. O’Neill played on three Frozen Four Terrier teams and won the Beanpot twice, two ECAC titles and the national championship in 1978. 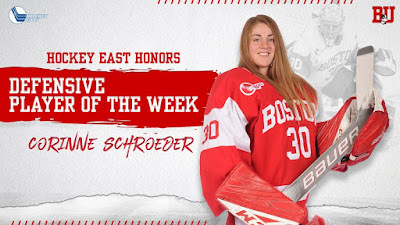 Goalie Corinne Schroeder was named Hockey East’s Defensive Player of the Week for the fourth time this season. In a pair of wins, she had a 1.35 GAA and .958 save percentage.